Berry at My Berry... / Hey, EEP! The name is just too much to resist. 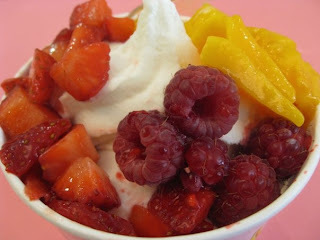 In the world of frozen yogurt we're inundated with the berry. 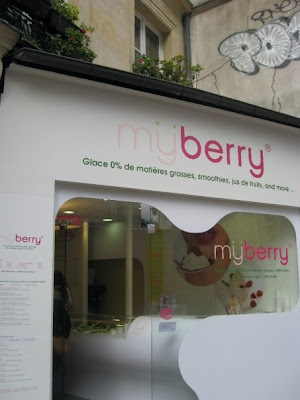 Berry Berry, Pink Berry, My Berry...Berry...Berry...Berries galore! Not that I'm complaining. It's quite flattering to see your nickname plastered on the sides of all sorts of frozen treats. It's just a bit hard to keep all of your berries in order, ya know? moyen yogurt with a choice of 3 toppings: chocolate chips, granola, slivered almonds, white chocolate disks, walnuts, melon, mango, strawberries, raspberries, kiwi or pineapple. There's also a selection of yogurt smoothies and, oddly enough, a soup of the day. I went for a moyen with framboises, fraises, mangues. Yum. Yum. Yum. Carried had la même chose. The Pink Berry vs. My Berry taste-off officially began! 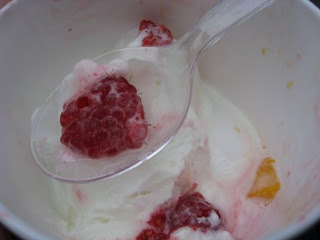 Actually, I've never had Pink Berry before so a taste-off wasn't really possible. 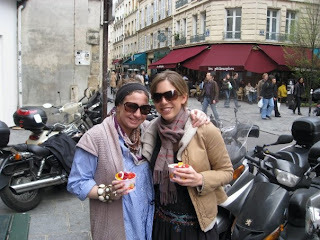 However Carrie said our french feast was of comparable quality. She did mention that she wished they had banana as a topping though. Tisk, tisk. This being my first time tasting such a trendy frozen dessert, I must admit I was pleased. Many people complain of the price. I agree that for a snack 5 euro a cup is a bit steep. Easy solution. Do what we did and eat it for lunch. You'd spend 5 euro on a sandwich in a boulangerie anyway! I anticipate many more trips to My Berry as the weather continues to warm. 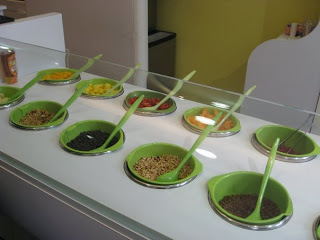 I hear rumor to the fact that there is now coffee flavored Pink Berry in New York, is this true?